The Yosemite Valley is carved deep into the gently sloping western flank of the western part of the Sierra Nevada, and characterized by its ‘U’ shape. However, the Valley was ‘V’ shape until the Ice Age when geological forces started pushing the hills and mountains higher and higher, and the Merced River flowed more quickly and violently through the Yosemite Valley. The Ice ages caused major changes to the valleys and landforms, as glaciers of 2,000 feet thick flowed through the valley, these glaciers carved away the bottom of the valley from a ‘V’ to the broader ‘U’-shape as seen today. Today, the Yosemite Valley offers visitors unique views of towering cliffs, spectacular waterfalls and the beautiful Alpine scenery. Marvel in awe at Yosemite’s natural wonders, which include waterfalls, granite-polished domes and hanging rocks such El Capitan, Cathedral rocks, and Half Dome. 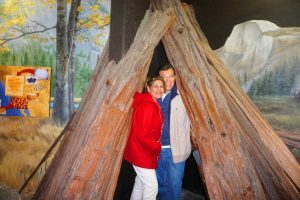 There are also many other sights and attractions to see in Yosemite Valley including museums, visitor centers and much more. 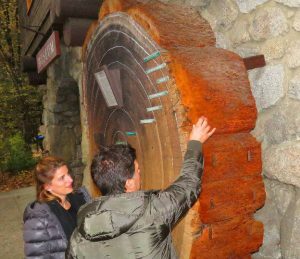 Yosemite Valley Visitor Center: Year-round facility offering visitors to Yosemite useful information, maps & brochures, nature exhibits, a bookstore and an educational movie theater about Yosemite National Park history, geology and biology. Yosemite Valley center is located at 9035 Village Dr, Yosemite Valley, CA 95389. The museum and visitor center are open daily from 9 am to 5 pm (winter and holiday schedules might differ, so ensure to call before you head there (209-372-0200). 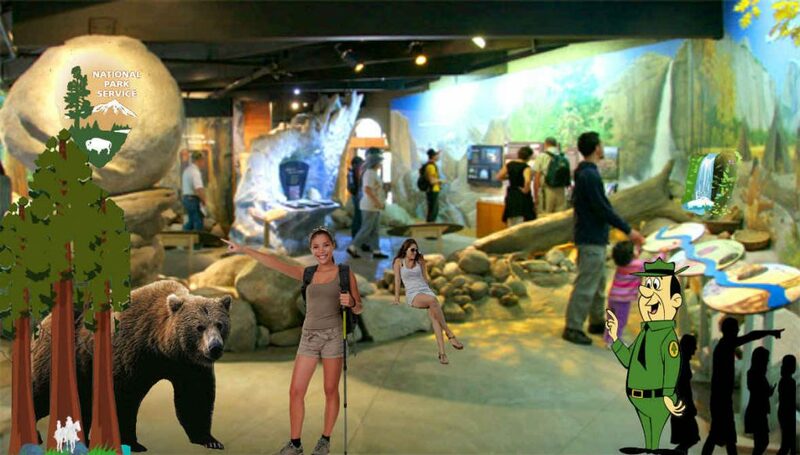 The Yosemite Valley Visitor Center has an exhibit hall, where you can learn how Yosemite’s spectacular landscape was formed, how people have interacted with it through the centuries, how wildlife adapts and survives and how your national park continues to evolve. A free 23-minute film provides a stunning overview of Yosemite’s splendor. 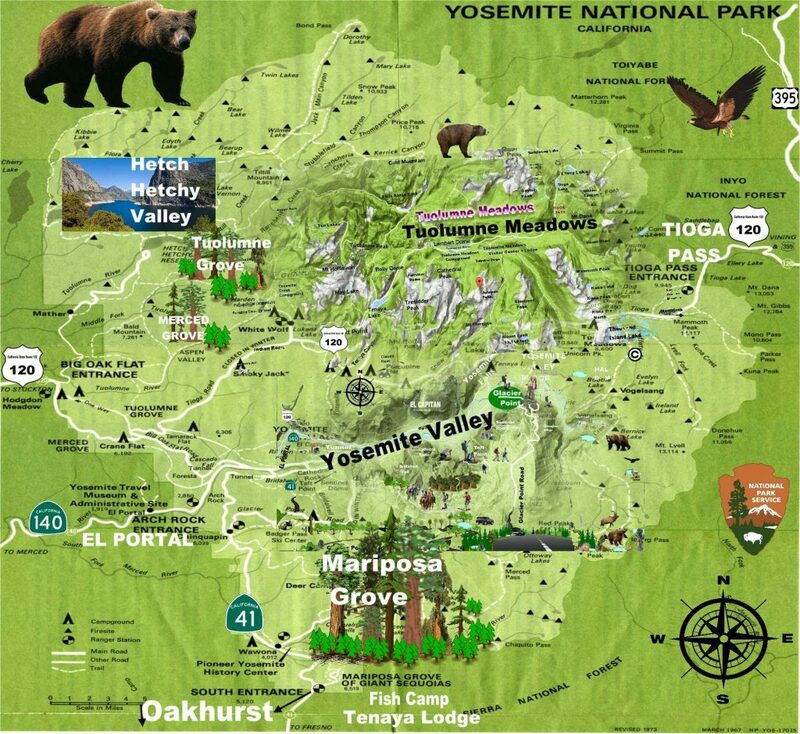 Yosemite Valley Wilderness Center(open May to October) offers wilderness permits, bear canisters, maps, and guidebooks. 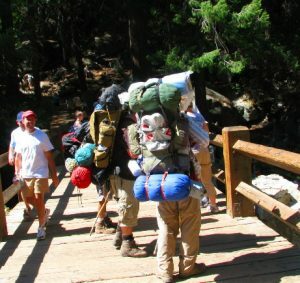 Information on pre-trip planning, minimum-impact camping and the Yosemite Wilderness, is also available. 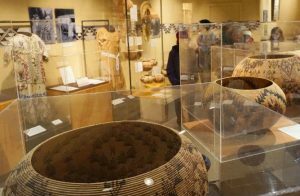 Yosemite Museum (all year): The Indian Cultural Exhibit and Village interprets the cultural history of Yosemite’s native Miwok and Paiute people from 1850 to the present. Demonstrations of traditional skills are presented. The Gallery offers art exhibits periodically throughout the year. Nature Center at Happy Isles(May to September): Designed for nature-exploring families, this center offers natural history exhibits, and interactive displays. Nearby are short trails through the area’s forest, river, and fen environments. Evidence of the huge 1996 rockfall from the Glacier Point cliff is visible above. 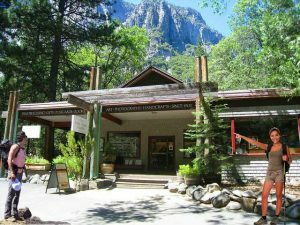 Yosemite Conservation Heritage Center, formerly LeConte Memorial Lodge (late May to early September): Yosemite’s first public visitor center, operated by the Sierra Club, features a children’s corner, library, and a variety of environmental education and evening programs. The Ansel Adams Gallery offers work of Ansel Adams, contemporary photographers, and other fine artists. In addition, a wide selection of handcrafts, books, gifts, and photography supplies is available. The Gallery, formerly known as Best’s Studio, has been operating in the park since 1902. 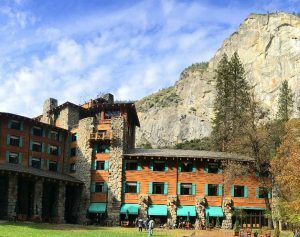 The Majestic Yosemite Hotel (formerly The Ahwahnee), a famous hotel and National Historic Landmark, is popular even for those not staying there. Completed in 1927, it was built in a rustic style with American Indian design. Historic paintings of Yosemite, stunning stained-glass windows, and woven tapestries grace the walls. The Great Lounge and Dining Room are architectural examples of rustic elegance. The Indian Village of the Ahwahnee “The Ahwahneechees”: The Indian Village is adjacent to the Yosemite Valley Visitor Center, it reflects and depicts how the native Miwok and Paiute Indians once lived in these lands for thousands of years. 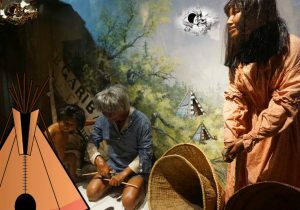 Walk and visit the reconstructed Indian Village of the Ahwahnee people. Once the Yosemite Valley was called “Ahwahnee” which means the gaping mouth-like place. The Native Americans who once lived here called themselves “the Ahwahneechees”. 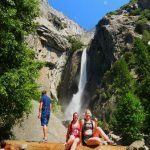 Easy Short hikes: Hike to Yosemite Falls and Bridalveil Fall. Try it in spring and early summer, when the waterfalls are at their best. If you have time, consider renting a bike, ride a horse or simply hike through the Valley Floor Loop; it’s easily accessible from many places throughout the valley floor. 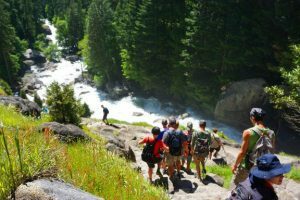 The full loop takes more time; however, the loop is quite interesting as it takes hikers throughout the Valley Floor’s top sights and attractions like Yosemite Falls, El Capitan, Bridal veil Fall, the Merced River sights and overlooks. 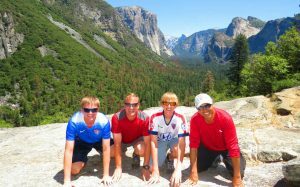 Strenuous hikes: For a more challenging hike to Vernal and Nevada falls, and for even more and strenuous hikes, get up at 5 am and hike all the way to the top of Half Dome via the Mist Trail. This is an extremely difficulty and long hike of 9.6 miles, round-trip, with 3,200ft elevation (these hikes are seasonal permits are required). 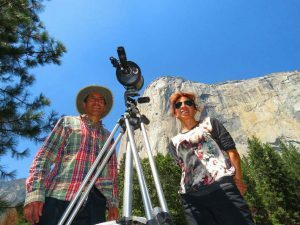 Visit Tunnel View; this is an iconic and scenic overlook offering commanding views of Yosemite Valley where visitors can picture many sights from the viewpoint, like El Capitan, Bridalveil Fall and Half-Dome. From this legendary site that was first opened in 1933, many locals and internationally renowned artists and photographers have painted, drawn, and photographed the dramatic scenery from Tunnel View and nearby vantage points since the 19th century. This spot can get extremely crowded with tour buses and visitors, but still makes the list of top places to see in Yosemite National Park. From here you get a view of Yosemite Valley, Bridalveil Fall, Half Dome, and El-Capitan. Although this popular place gets very crowded in summer, but it’s nearly abandoned in wintertime which provides a sense of freedom and great solitude. This is where professional photographs merge when snow falls to capture the breathtaking views and photographs of the Yosemite Valley. 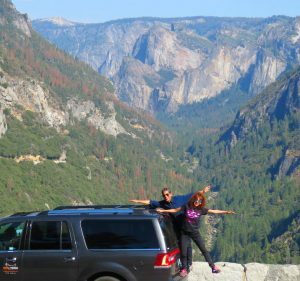 Don’t miss out on the other Tunnel view a stunning overlook called ‘Big Oak Flat Road Tunnel’, it’s spectacular and offers views of Cascade Fall, The Elephant Rock, Clouds Rest, Half-Dome, El Capitan, Bridalveil Fall and The Merced River. Yosemite Falls: Walk from Yosemite Village for about 10 minutes (0.5 miles/0.8 km round trip) on an easy hiking trail to the base of the Yosemite lower waterfall. 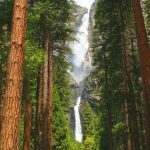 As you hike towards Yosemite Fall, you will first notice that there are three waterfalls in one: The Yosemite Upper Falls, the Yosemite Middle Falls, and the Yosemite Lower Falls. The Yosemite falls combined drop a total of 2425-foot (739m) down in the Yosemite Valley, this is the highest waterfall in North America and sixth largest in the world! the best time to visit is in the spring and early summer, when the waterfalls are their best. However, winter is probably the best season to visit the Yosemite National Park because it’s so serene and peaceful, and far less crowded than all other seasons. Bridalveil Fall: A short walk to the base of this 620-foot (189-meter) waterfall. The trail from either parking lot to Bridalveil Fall (0.5 miles), is fairly easy and accessible. It’s open year-round. When the water is at its peak in spring and early summer, you can expect to get wet! In some cases, the spray is so strong, you may not even be able to easily access the end of the trail. Expect icy and very slick conditions in winter. Hike safely as the trail, rocks and boulders are slippery in winter and spring. The Ahwahneechee Native American tribe once believed that inhaling the mist would improve your chances of getting married. Half Dome is a well-known granite dome rock formation in the park at the eastern end of Yosemite Valley. It is named for its distinct shape. One side is a sheer face while the other three sides are smooth and round, making it appear like a dome cut in half. The granite crest rises more than 4,737 ft (1,444 m) above the valley floor. 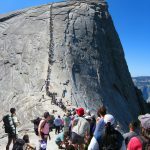 Half Dome is a very public climb ascended in several different ways. Thousands of hikers reach the top each year by following an 8.5 mi (13.7 km) trail from the valley floor. After a rigorous 2 mi (3.2 km) approach, including several hundred feet of granite stairs, the final pitch up the peak’s steep but somewhat rounded east face is ascended by hikers with the aid of a pair of post-mounted braided steel cables originally constructed close to the Anderson route in 1919. Most hikers take about 12 hours to hike all the way up Half Dome and back; some hikers take even longer. Park visitors have to get up extremely early and be in good physical condition because this is a very challenging hike and some hikers die in Yosemite each year. 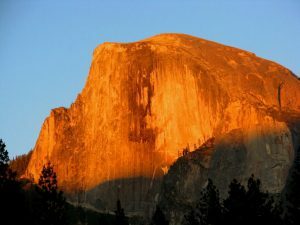 Although very few fatalities are on Half Dome, many accidents have been reported. From 1919 when the cables were erected through 2011, there have been six fatal falls from the cables. The latest fatality occurred on July 31, 2011. Lightning strikes can also be a high risk while on or near the summit. On July 27, 1985, five hikers were struck by lightning, resulting in two fatalities. The Half Dome Cable Route hike runs from the valley floor to the top of the dome in 8.2 mi (13 km) (via the Mist Trail), with 4,800 ft (1,460 m) of elevation gain. 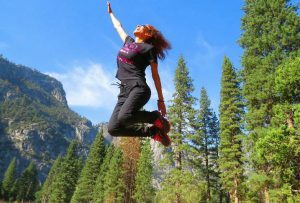 The hike can be done from the valley floor in a single long day, but many people break it up by camping overnight in Little Yosemite Valley. 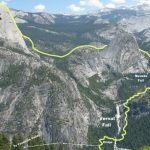 The trail climbs past Vernal and Nevada Falls, then continues into Little Yosemite Valley, then north to the base of the northeast ridge of Half Dome itself. The final 400 ft (120 m) ascent is steeply up the rock between two steel cables used as handholds. Since 2011, all hikers who intend to ascend the Cable Route must now obtain permits before entering the park. Permits are checked by a ranger on the trail, and no hikers without permits are allowed to hike beyond the base of the sub-dome or to the bottom of the cables. Hikers caught bypassing the rangers to visit either the sub-dome or main dome without a permit face fines of up to $5,000 and/or 6 months in jail. On March 28, 2009, a large rock slide of 1,500,000 cubic feet (42,000 m3) occurred from Ahwiyah Point. The slide happened at 5:25 a.m. and damaged a large area under the dome. No one was injured, but hundreds of trees were knocked down, and a portion of the Mirror Lake trail was buried. The slide registered on seismographs as an earthquake reaching 2.5 on the Richter Scale. El Capitan – The majestic granite monolith of El Capitan extends about 3,000 feet (900 m) from base to summit along its tallest face and is one of the world’s favorite challenges for rock climbers and BASE jumpers. Along with most of the other rock formations of Yosemite Valley, El Capitan was carved by glacial action. Several periods of glaciation have occurred in the Sierra Nevada, but the Sherwin Glaciation, which lasted from approximately 1.3 million years ago is considered to be responsible for most of the sculpting. Once considered impossible to climb, El Capitan is now the standard for big-wall climbing. It has two main faces, the Southwest (on the left when looking directly at the wall) and the Southeast. While today there are numerous established routes on both faces, the most popular and historically famous route is The Nose, which follows the south buttress. 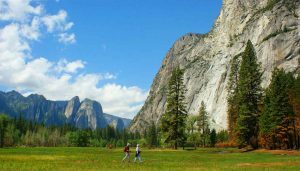 El Capitan Meadow is a beautiful open meadow and the perfect place for hiking and photographing Yosemite Valley sights and hanging cliffs. During the last two weeks of February when weather conditions align perfectly and the setting sun turns the waters of Horsetail Fall into a majestic fire of red and orange light. Another great view is from El Capitan Meadow valley floor where visitors usually observe rock climbers on the ‘Nose’ of El Capitan. Yosemite Valley River View – Yosemite Valley View is a spectacular and a must-see photo stop in Yosemite Valley. Located along one-way Northside Drive, it is the best to stop here on your way out of Yosemite Valley. It offers majestic views of El Capitan, Half Dome, Cathedral Rocks and Spires and a wide-open view of Yosemite Valley, Bridalveil Fall and the Merced River. This underrated overlook inspired postcards and iconic photographs by independent photographers, artists and designers. The Swinging Bridge is a popular destination for locals and visitors in Yosemite Valley, mostly for swimming, with an excellent view of Yosemite Falls. The land in the area resembles that of a beach. Although official policy does not allow visitors to jump off the bridge, this is still a popular place to jump into the Merced River despite the cold water. The area on both sides of the bridge has mostly shallow water with a few areas of 6 feet in depth in summer. Cathedral Beach Picnic Area is also a beautiful picnic ground along the Merced River with views of El Capitan. 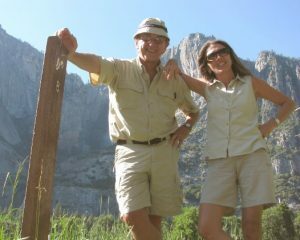 As you enter the Yosemite Valley, Cathedral Beach is the first of three places to picnic or swim that I can recommend. Mirror Lake and Hike – Mirror Lake is a small, seasonal lake located on Tenaya Creek in Yosemite National Park. Situated in Tenaya Canyon directly between North Dome and Half Dome, it is the last remnant of a large glacial lake that once filled most of Yosemite Valley at the end of the last Ice Age, and is close to disappearing due to sediment accumulation. This trail is open year-round. 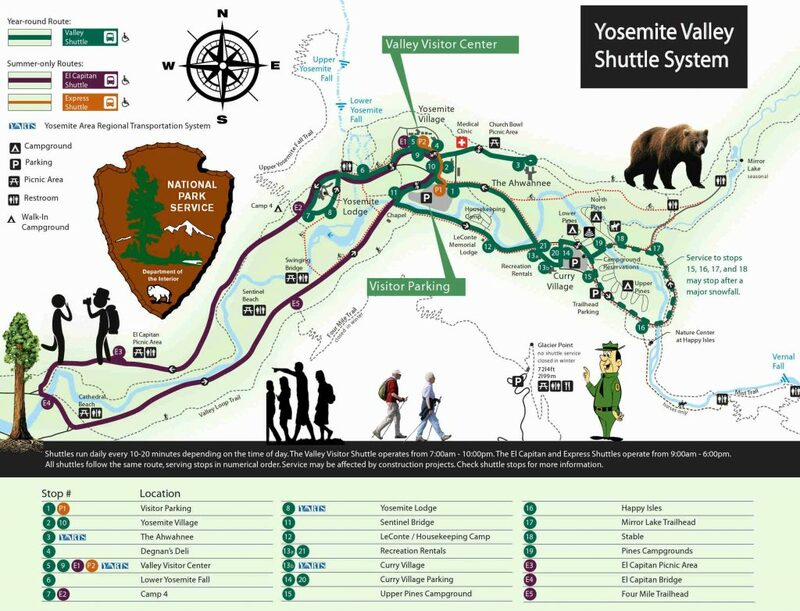 This trail is 2 miles (3.2 km) round trip to lake and back; 5 miles (8 km) loop around lake it begins at Yosemite Valley shuttle bus stop #17. The first mile of this trail is a paved service road that leads directly to Mirror Lake. You may access the loop trail from the end of the paved path. The loop follows Tenaya Creek beyond the lake, and crosses two bridges after the Snow Creek Trail junction before returning past Mirror Lake on the south side of Tenaya Canyon. 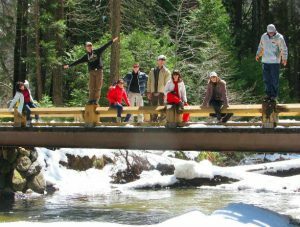 In winter, it can be icy and snowy, especially along the south side of Tenaya Creek. With a fresh perspective looking up at Half Dome directly from its base, you’ll be rewarded with views of Tenaya Canyon, Mount Watkins, Washington Column, and Half Dome reflecting in the lake. In 2009, a large rock-slide of 1,500,000 cubic feet (42,000 m3) occurred from Ahwiyah Point. The slide happened at 5:25 am and damaged a large area under the Dome. No one was injured, but hundreds of trees were knocked down, and a portion of the Mirror Lake trail was buried. The slide registered on seismographs as an earthquake reaching 2.5 on the Richter Scale. Difficulty: Moderate hike but can be steep in some areas. Difficulty: Strenuous and takes about 2 to 3 hours. 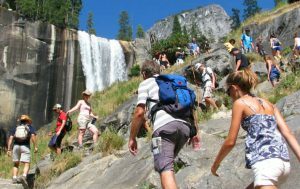 You can also take the John Muir Trail to the top of Vernal Fall (via the Clark Point cutoff) and the top of Nevada Fall, or combine the Mist Trail and John Muir Trail into a loop. See the map, profile, and description below for more information. The 14- to 16-mile round-trip hike to Half Dome is not for you if you’re out of shape or unprepared. You will be gaining elevation (for a total of 4,800 feet) most of your way to the top of Half Dome. Most would say the reward is worth the effort. 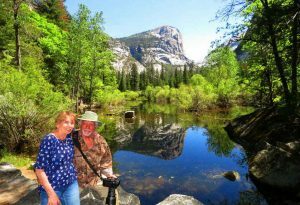 Along the way, you’ll see outstanding views of Vernal and Nevada Falls, Liberty Cap, Half Dome, and–from the shoulder and summit–panoramic views of Yosemite Valley and the High Sierra. Most hikers take 10 to 12 hours to hike to Half Dome and back; some take longer. If you plan on hiking during the day, it’s smart to leave around sunrise (or earlier) and then have a non-negotiable turn-around time. For instance, if you haven’t reached the top of Half Dome by 3:30 pm, you will turn around. Check for sunrise and sunset times before you hike. Regardless, each person should carry a flashlight or headlamp with good batteries (hikers commonly struggle down the trail after dark because they don’t have a flashlight). Although the trail is well marked, you should be prepared with a good topographic map and compass and know how to use them. Half Dome Cables- The most famous–or infamous–part of the hike is the ascent up the cables. The two metal cables allow hikers to climb the last 400 feet to the summit without rock climbing equipment. Since 1919, relatively few people have fallen and died on the cables. However, injuries are not uncommon for those acting irresponsibly. Tips while using the cables: Take your time and be patient with slower hikers, Allow faster hikers to pass you (when possible), Remain on the inside of the cables, Do not attempt the ascent if: Storm clouds are in the area, The ground is wet (the cables and rock become very slick when wet; most accidents on the cables occur during wet conditions). The cables are down for the winter (typically, from the day after Columbus Day until Memorial Day weekend) (check conditions update for status and any available updates). Preparation: Footwear- Bring well broken-in boots with good ankle support and good traction. Some of the most common injuries Half Dome hikers suffer are blisters and ankle injuries; good footwear is the best way to prevent these problems. Gloves: Many people find gloves helpful on the cables. However, if you bring your gloves up, pack them out. Hundreds of pounds of rotting gloves otherwise accumulate. Trash: There is no trash service on trails. While hiking in Yosemite, be sure to pack out all trash. When possible, you can help park rangers by picking up trash that you encounter on the trail. Bearproof trash cans are available at trailheads. Altitude Sickness – A few visitors each summer have problems with altitude sickness. Symptoms may include severe headache and/or nausea. The only way to relieve altitude sickness is to descend immediately. Other environmental illnesses include heat exhaustion, dehydration, and hyponatremia (low electrolyte levels). In addition to drinking plenty of water, be sure to eat, and to take regular rest breaks in the shade. Emerald Pool – Entering Emerald Pool and the Silver Apron is prohibited, and entering pools above waterfalls is strongly discouraged, because of frequent injuries and fatalities. Use extreme caution near flowing water; rocks adjacent to streams can be surprisingly slick. 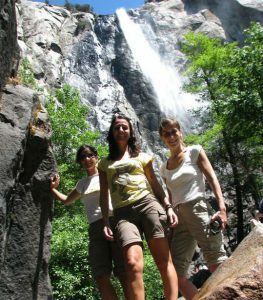 This very popular hike originates near Happy Isles in eastern Yosemite Valley (shuttle stop #16). 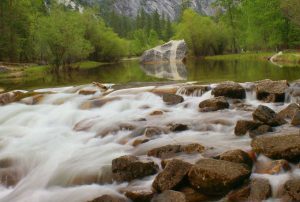 The John Muir and Mist Trails offer spectacular, up-close views of two large waterfalls, enjoyable scenery along the Merced River, and unique views across Yosemite Valley. 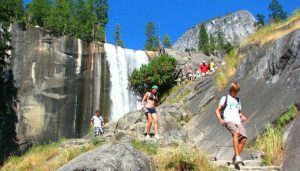 This first paved mile of trail is busiest and accesses the Vernal Fall Footbridge. Almost entirely uphill, you can appreciate views along the way, and during spring, when the water levels are at their peak, you can also glimpse Illillouette Fall from this first section of trail. You’ll find an excellent view of Vernal Fall from the footbridge at 0.8 miles (1.3 km). About 0.2 miles (0.3 km) beyond the bridge, the Mist Trail and the John Muir Trail diverge. To proceed directly to the top of Vernal Fall, follow the Mist Trail 0.5 miles (0.8 km) up a steep granite stairway of over 600 steps. Prepare for slippery footing and a tremendous amount of waterfall spray in spring and early summer (hence the name for this trail!). 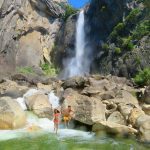 You will delight in views of Vernal Fall all along this stretch of trail and may even be able to see a rainbow in the spray of the fall. At the top of Vernal Fall, you can experience jaw-dropping views straight down the length of the 317-foot waterfall (please don’t cross the railings and use extreme caution while you’re near any flowing water or wet rock in this area). From this point, you can: choose to turn around and head back the way you came; continue up to the next junction (about 0.2 miles / 0.3 km) and take the longer route back via the John Muir Trail; or continue uphill on the Mist Trail to the top of Nevada Fall. If you choose to continue on the Mist Trail, shortly beyond Vernal Fall, you will pass by Emerald Pool and Silver Apron. Both of these looks may look inviting on a hot summer’s day, but it is illegal and dangerous to swim here due to the extremely hazardous current. Continuing along the Mist Trail, you’ll experience another 1.5 miles (2.4 km) of steep, rocky switchbacks in order to reach Nevada Fall. Crashing down 594 feet, this thunderous waterfall is fullest in spring and early summer, and you will find terrific photographic opportunities along this stretch of trail. At the top of the climb, head right to reach the footbridge that crosses the Merced River above the fall, allowing you a closer view of it. Use extreme caution while you’re near any flowing water or wet rock in this area. From here, you can either return down the Mist Trail, or continue over the bridge to the John Muir Trail for an alternate route back to Yosemite Valley. 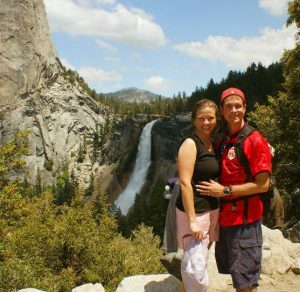 If you choose the John Muir Trail, you will enjoy different scenery, with great views of Liberty Cap and different views of Nevada Fall. The John Muir Trail is longer—approximately 4 miles one-way compared to the Mist Trail’s 2.5 miles (4 km)—so plan accordingly. 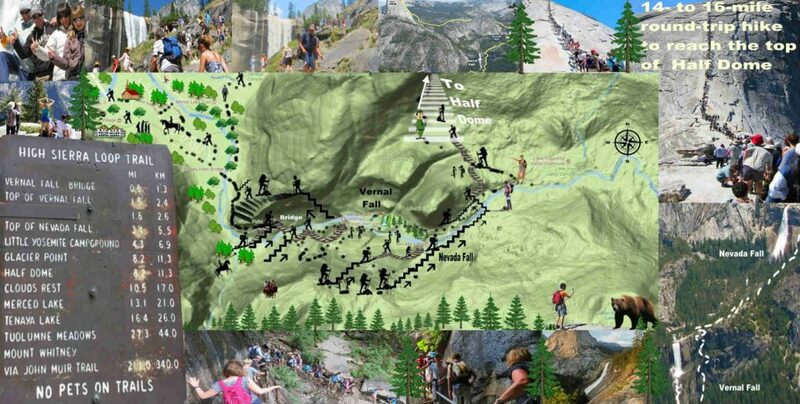 Some hikers may be continuing from the top of Nevada Fall to hike to Half Dome or elsewhere in Yosemite’s wilderness. Seasonality: You can hike to both waterfalls all year. However, in winter, there is a specific route that remains open while some sections of trail are closed. The lower portion of the Mist Trail along Vernal Fall closes in winter due to risk of falling ice and rock. 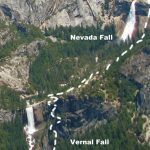 The upper portion of the John Muir Trail between Clark Point and the top of Nevada Fall is closed in winter due to treacherously icy conditions. Keep in mind that the sections of trail that remain open in the winter may be very icy and/or snowy. View current conditions for trail closures and view historical opening and closing dates for this trail. Sentinel Bridge and the Merced River in Yosemite Valley – Spanning Merced River, Sentinel Bridge and Stoneman Bridge are elegant structures providing some unique views of Yosemite National Park. Located within Yosemite National Park, Sentinel Bridge is famous for its spectacular views of Half Dome reflected in the Merced River Sentinel Bridge is a must-see stop for all photographers. This is one of the most famous sunset places in Yosemite for visitors who have no time to travel to Glacier Point for sunset photographs. Sentinel Bridge is famous for its views of both Half Dome reflected in the Merced River. Visitors also enjoy beautiful views of Yosemite Falls. 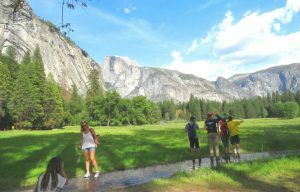 Cook’s Meadow Loop is recommended for walkers and hikers, or even visitors who can’t hike, to enjoy views of Yosemite Falls, Half Dome, Sentinel Rock, and Royal Arches from the center of Yosemite Valley. This is an easy and flat paved trail of 1 mile (1.5 km) loop. 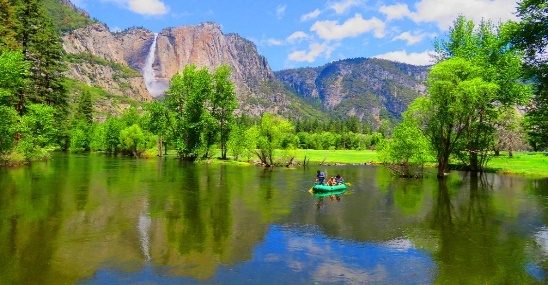 Among other activities in Yosemite Valley are horseback riding, swimming, rock climbing, walking hiking, kayaking and rafting in Merced River. Visiting Yosemite National Park during the winter season as a memorable experience filled with scenic and snowy landscapes, steaming waterfalls and a new and wintry perspective of this unique national park. Visiting the Yosemite National Park Valley in winter is a “revelation “for visitors and nature lovers. Winter is the perfect time to experience Yosemite National Park as it is much less crowded than during any other season. Winter in Yosemite typically begins in November and lasts until April. Certain attractions and roads are seasonal and may not be accessible to vehicles during the winter time due to heavy snow falls. Private custom tours by 4×4 SUV are highly recommended.